An eclectic mixed native and exotic coastal garden with plantings of Eremophila glabra, Lomandra longifolia Tanika, Eremophila glabra Kalbarri Carpet and Salvia discolour. Do you remember Nana’s garden?—a scratchy buffalo lawn, some geraniums and conifers; perhaps a vegie patch featuring iceberg lettuce and, of course, the iconic Hills Hoist clothesline. Perhaps you remember, as a kid, frolicking under the sprinkler for hours as the mercury rose along with the water meter? Such fun! Back then, almost everyone ‘did’ their own gardens. While some DIY gardens were waterwise, many weren’t. We’ve come a long way since then with our awareness of how to conserve water. How will the garden be used? How much space will be devoted to plants? Consider the best areas for seats around the garden. This can increase enjoyment of the garden. How much time do you have to spend on maintenance? Do you want to attract wildlife including birds? Do you want a birdbath (but do you have a cat)? Is it windy? Wind dries plants out quickly and you may need to consider a windbreak. Do you need some shade trees? How about food plants? Although edibles are not considered to be waterwise, a study done by Permaculture co-founder David Holmgren found home gardeners can use as little as one-fifth of the water of commercial growers per dollar value of produce. Wicking beds for vegetables are definitely worth investigating (see Renew 135 and 138 for DIY wicking bed plans). Consider hydrozoning your garden. This simply means grouping plants with similar water needs together; for example, don’t put succulents and vegies together. You can also zone for other needs; for example, keep acid-loving plants (e.g. blueberries) separate from those that need a neutral or alkaline soil (e.g. brassicas such as kale and broccoli). Think about what style of garden you prefer. You’ll also want to think about when to plant. In warm temperate zones down south in Australia, the ideal time to plant is in autumn, which gives a good six to nine months before the scorch of summer. In cooler zones, autumn or spring can work well. The tropics and sub-tropics require quite different considerations which we don’t have space to discuss here (see Renew 135 for a discussion of tropical gardening). (Left) Dappled shade as from this Eucalyptus caesia Silver Princess allows for a range of under-plantings, here including succulents Senecio mandraliscae (blue chalksticks) and Cotyledon orbicularis. 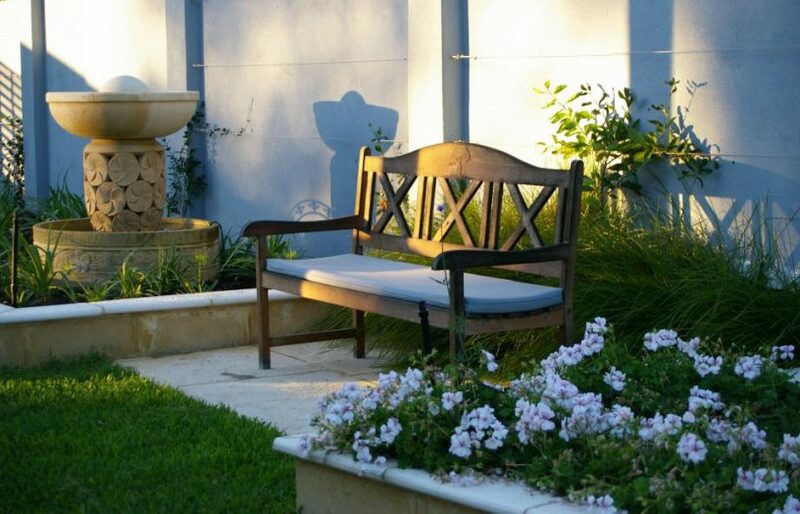 (Right top) Why not include seats as part of your garden design to increase enjoyment and use of your backyard? 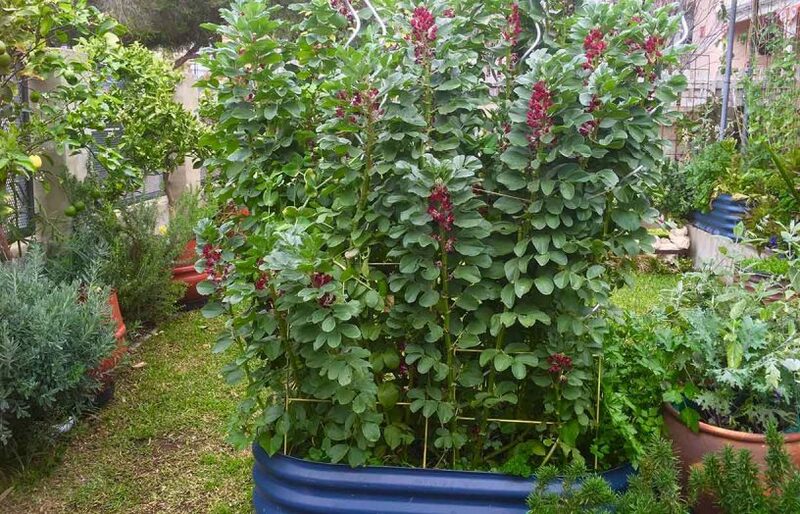 (Right bottom) Vegies like these lovely crimson-flowering broad beans can have a role in a waterwise garden—consider use of wicking beds. What is a waterwise plant? Waterwise (or dry-tolerant) plants are capable of surviving long periods without water, once established. Succulents are probably the exception to the ‘once established’ rule as they are waterwise from the start! If you are unsure if a plant is dry tolerant, observe the leaves. If they are small, needle-like, succulent, leathery, furry, silver or grey, it’s likely to be dry tolerant. Ditto if the roots are fleshy or have water storing nodules on the roots; see for example, clivias, daylilies, agapanthus and liriope. Interestingly, established camellias are incredibly dry tolerant but people may not plant them because they think they guzzle water. Ironically, kangaroo paw cultivars can be water-demanding in sandy soils. Cultivars bred to flower year-round need food and water to do this. In nature, they are considered annuals. Be aware that the same waterwise plant in sandy soil may behave entirely differently in clay. This means you can’t just rely on plant labels: a good horticulturalist at your local garden centre is worth their weight in gold. 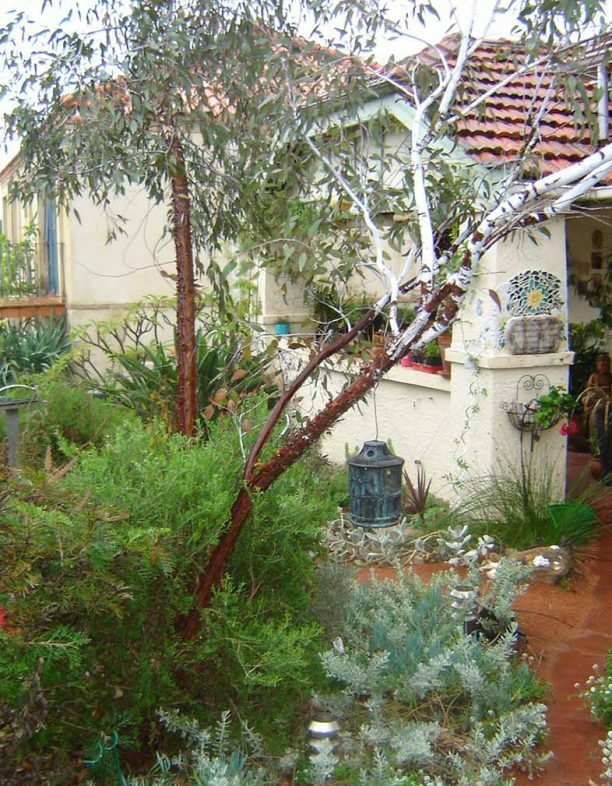 Australian native plants are the obvious choice for a beautiful waterwise garden. An attractive and biodiverse native landscape may well be possible without any irrigation, particularly if you use local indigenous plants. How well your plants survive on rainfall alone depends on the plant types, their origin and the soil conditions. For example, if you are gardening on alkaline sandy soil in an exposed area with no trees, expect some plant losses, even with local native plants. It is a tough gig surviving these conditions. For those who prefer more choice than just local native species, some irrigation is recommended. Blended native and Mediterranean gardens are becoming increasingly popular. Here you can layer plants of similar (low) water needs to complement each other, giving year-round texture, colour and interest. 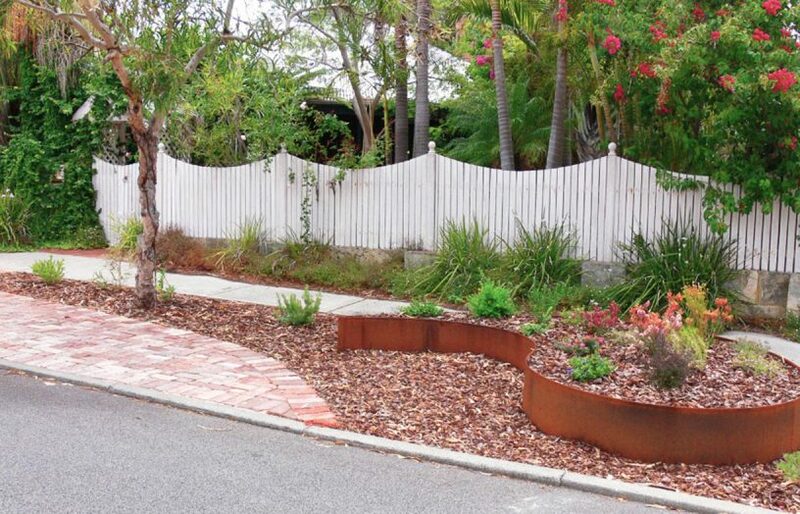 Succulent and local coastal native gardens win the prize for the most waterwise styles. Succulents have flowers which attract native birds and their popularity is soaring: the forms are so varied, they are easy to maintain and they are virtually bullet-proof. They are also ideal to plant under trees where there is little soil space due to root competition. Dry tropical plantings are also an option. Consider using frangipanis, ponytails, bougainvillea, agaves, crinum lilies, ZZ plant, philodendrons, hoyas and aloe trees, as these all perform well in dry conditions. They will need some irrigation though and the right soil conditions! Trees are critical in a waterwise design, providing shade and lowering the temperature under the tree by up to 10 °C on a hot day. In hot climates, plant deciduous trees to the north, east and west of the house to protect against scorching summer sun. Even native plants often appreciate some shade from an open canopied tree. Possible under-plantings include clivias, rock lilies (Arthropodium species), dianellas, lomandras, correas, groundcovers like Hemiandra pungens, Hibbertia scandens, Grevillea Gingin gem, Acacia saligna Springtime Cascade, Atriplex species and succulents. Soil preparation is critical for a successful garden, regardless of style. Local native gardens are an exception, but even indigenous plants grow better if the soil is improved a little. The old saying, “spend a dollar on the plant and ten dollars on the soil” may be an exaggeration, but it is a good maxim to keep in mind. Soil preparation for clay includes incorporating organic matter such as compost and soil conditioners with gypsum. In sandy soils, mix powdered clay with the compost when preparing the planting hole. Always mix any amendments thoroughly throughout the soil at a depth of 30–35 cm. Biochar is the ‘new’ soil-amending kid on the block. It retains water and nutrients, supports microbial life, increases plant vigour and improves soil wettability and drainage in clay. After planting, protect plants and soil with a 5–6 cm layer of chunky tree-pruning mulch. Councils often offer this to residents for free or you can source it from a tree surgeon. Avoid peat/karri mulch: being fine it tends to absorb water without allowing it to penetrate the soil. Greywater success! 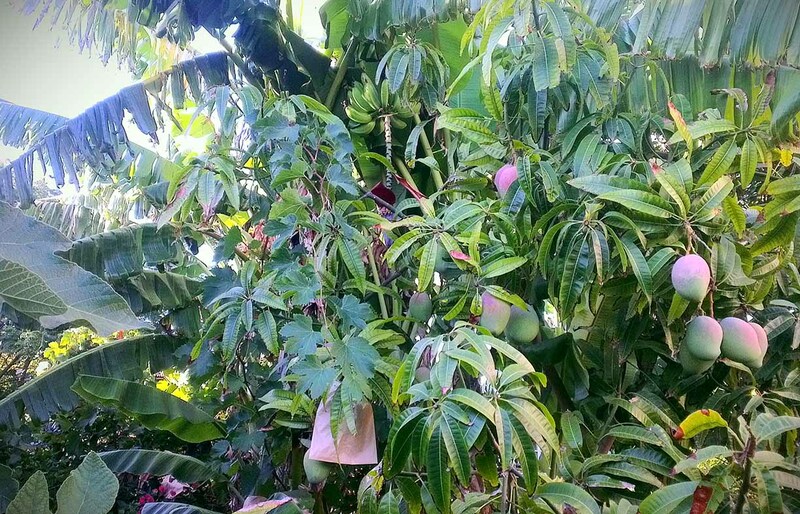 Mangoes and bananas grown from shower water. 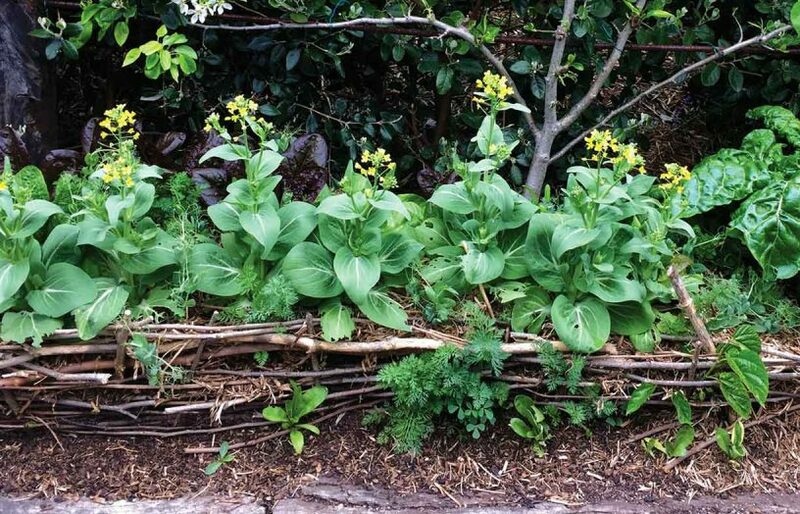 Plants which can cope with brief periods of flooding are ideal for greywater gardens. They must also be tolerant of excess phosphorus, alkalinity and salinity. Fats in the water can make the soil hydrophobic, so plants also need to be drought-tolerant. It’s a big ask. 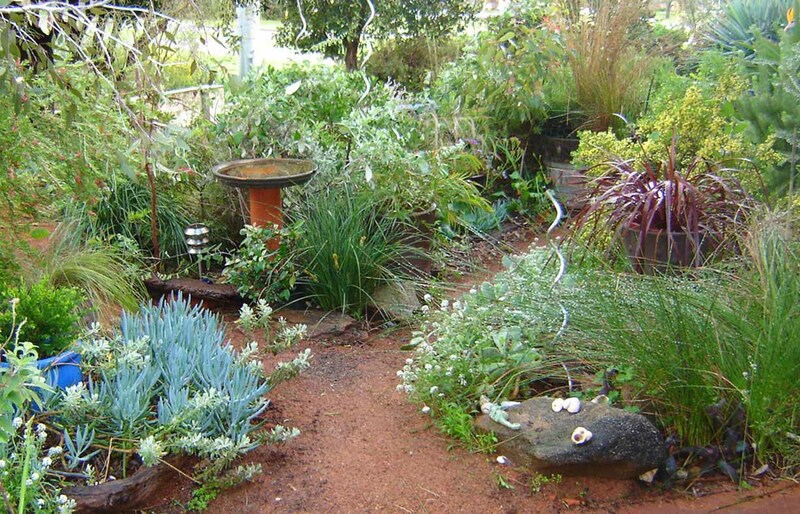 Suitable greywater plants include couch and buffalo lawns, fruit trees (drainage must still be adequate), callistemons, melaleucas, westringias, kangaroo paws, sedges and many grasses. Being realistic about the sacrifices you may have to make in the bathroom and laundry is the first step to a healthy greywater garden. Say goodbye to fancy hair shampoos and conditioners, chemical body washes, fabric softeners and hair dyes. Say hello to simple, natural products like Castile soap and eco liquid detergents. Ensure that your irrigation system has the capability to regularly add or switch over to ‘clean’ water from rain, mains or bore. This helps to flush out soap residue, maintaining the health of your soil. And turn off the greywater irrigation when it rains. Success with greywater is possible. In our previous garden in Perth, our 10 m2 banana and mango patch was irrigated by shower water. One year, we harvested 380 bananas and 36 mangoes. I suspect growth may have been supplemented by the ‘wee in the shower’ fairy, though this was never proven! Many established fruit trees are never watered in backyards and survive just fine; with greywater they will fruit more. Greywater is a wonderful resource but it requires some thought. Things to ponder include: How many people are producing how much greywater? How often are you away?—you’ll need to set up the mains water to take over when you are. State-based and council regulations also apply. 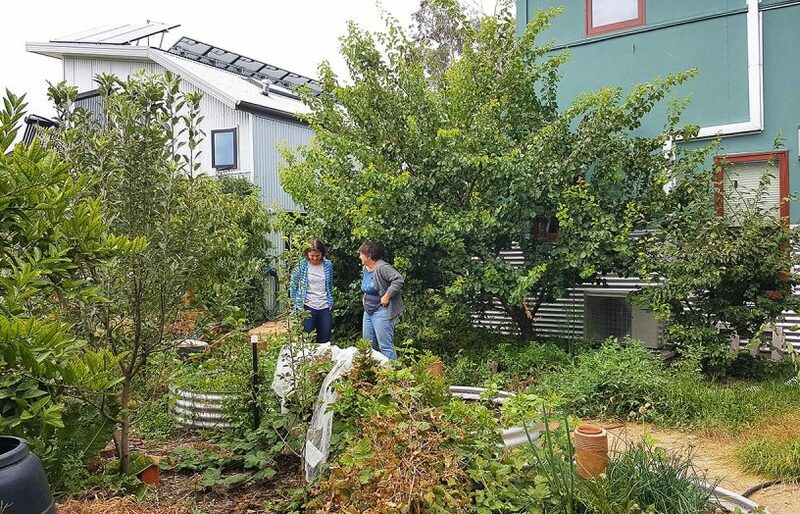 In Perth, the greywater pipes must be 300 mm away from paths, carports and boundary fences, 500 mm from buildings and one metre from retaining walls. There are also requirements regarding release of the greywater—it must be sub-surface—and holding periods. You can find out more in the Greywater Buyers Guide in Renew 130. At my house, we drink filtered rainwater and use it to water pot plants, fill ponds and wicking beds. However, even a couple of 1500 L tanks will empty quickly during a hot, dry spell if used for irrigation. Unless you have the space and budget for investing in large tanks, plumbing rainwater into the house for use in showers, laundry and toilets during the wet season is probably the best way to reduce your bills and save this precious resource. If well designed and located, vertical gardens can be waterwise. Our lush-looking vertical garden receives morning sun and is watered every one to two weeks in summer. Plants include bromeliads, anthuriums and Tradescantia purpurea. 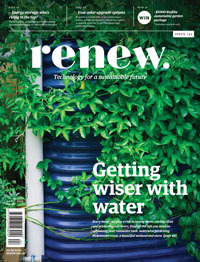 Succulent vertical gardens are an even better choice (see the article on vertical gardens in Renew 138). Waterwise gardens can be attractive, biodiverse and beautiful. Visit your local garden centre or, if you don’t feel confident to DIY, engage an experienced garden designer to create a garden which will thrive in your local conditions. Cherise Haslam runs Garden Deva, a Perth-based garden design company specialising in edible and dry-tolerant gardens. .